For the first seven nights at Camp 18 I did not sleep under a roof. We were blessed with fabulous weather that left most of us retreating inside a building only for an hour or two during our daily lectures. As the sun set, we all wandered around the rocks, looking for the best sleeping site we could find. Armed with bed rolls or sleeping pads, we knew we could tolerate a few bumps and rolls of rocks but the flatter the spot, the better. This of course could all be compromised for the view or proximity to the icefalls. 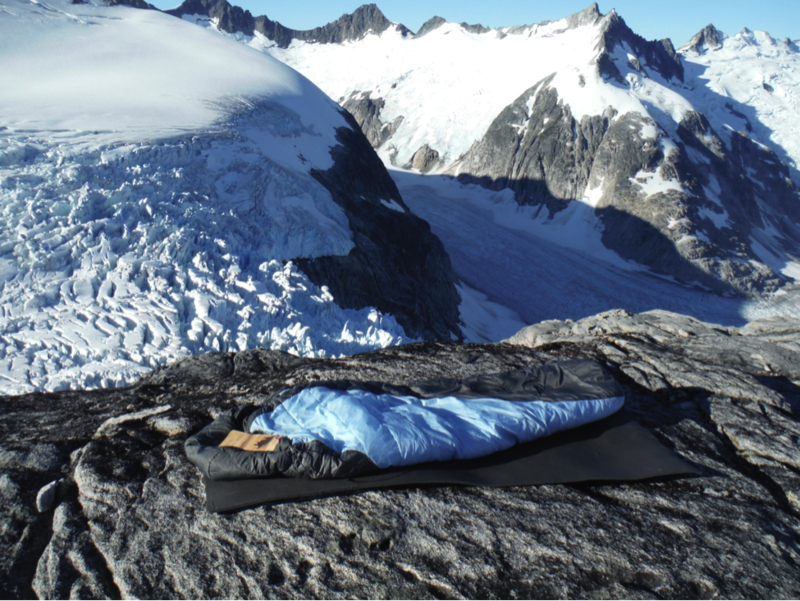 Yes, we were lulled to sleep by the sounds of the calving Vaughan Lewis Icefall under the clear night skies of Alaska. It sounds so wild and remote that sometimes I feel as if I am dreaming before I have even fallen asleep. Armed with a book for a pillow the Vaughan-Lewis Icefall can lull anyone to sleep. Photo by Sarah Bouckoms. We do our best to avoid sleeping and spend time finding constellations and hunting for aurora. I am familiar with the constellations of the Northern Hemisphere so it is a joy to see some old friends that have gone missing with the extended daylight hours this close to the Arctic Circle. An even greater joy comes when I am able to point out the constellations to the students. I have to explain the first fundamental rule to be an astronomer - having an overactive imagination. That, yes, this square over here is completely different from that square over there. Clearly one is Hercules, the brave warrior, the other is Pegasus, proudly soaring through the sky. The Summer Triangle also greets us shinning forth from the stars Vega, Altair and Deneb. Not to be forgotten is the slightly dimmer star Polaris which is near the North Celestial Pole, the special point that marks the axis around which the stars appear to rotate. It can easily be found by extending the distance between the last two stars in the Big Dipper. Surely every good Alaskan must know this group of stars since it is represented on the state flag. But did you know that it is not actually a constellation? Yes it is true. As Pluto is not a planet, nor is the Big Dipper a constellation. Have no fear though, for the group of stars that we know well as the Big Dipper resides in another constellation, Ursa Major. The Latin name translates to Big Bear. Another key ingredient to being a good astronomer is imagination. For the handle of the Big Dipper is actually the elongated tail of a bear and the four stars of the cup are the rear end and back of the bear. Further stars contribute to the face along with stars in groups of three to make up the paws. It is much easier to see the constellations when there is less light pollution, such as we are lucky to avoid on the Juneau Icefield. It seems a shame that the light from the stars should travel light years through outer space only to be dimmed out by the man-made light in the lower parts of the atmosphere just before it reaches our eyes. Thus is life in a world where we are no longer ruled by the solar cycle but a 9 – 5 workday. If you can manage to escape out to the country or turn the lights off in your house, you will be amazed at the glory of the stars and the white band that is the Milky Way. 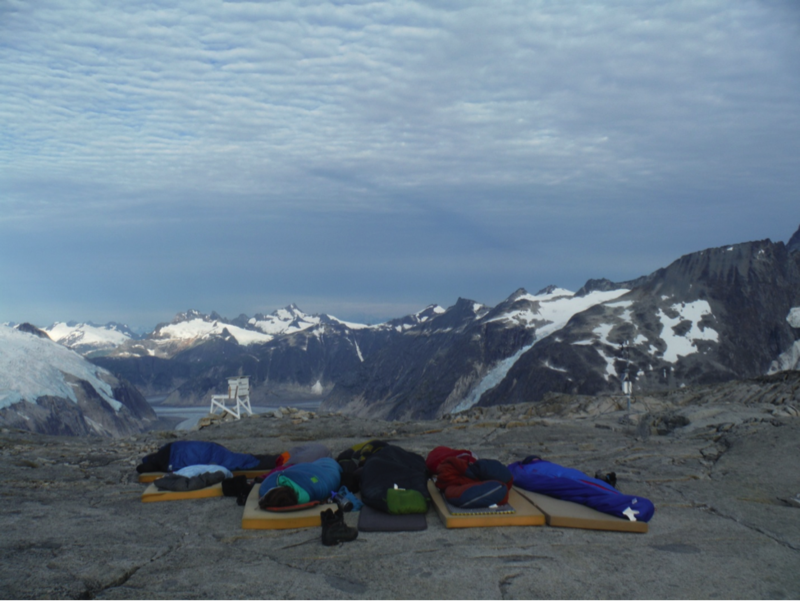 A group sleeping outside wakes to morning views of the Gilkey Trench. Photo by Sarah Bouckoms. While stars are pretty, that is not what we outside slumberers dream to see. What we really want to see are the solar particles colliding above Earth’s atmosphere attracted by the magnetic field. This fantastic display of collisions is responsible for the light that we call the Aurora Borealis in the Northern Hemisphere and the Aurora Australis in the Southern Hemisphere. The different colors are dependent on the type of particles interacting and the altitude. The sun emits electrons which interact with either Nitrogen or Oxygen. The collisions (and hence the aurora) are most prominent closer to the poles as this is where the magnetic fields converge, creating the greatest pull for the electrically charged particles emitted from the Sun. So if you are a good aurora hunter, what do you have to look for? The probability of the collisions happening in the winter is no greater than in the summer. The largest difference is that during the winter you have 12 + hours of darkness, which gives you a greater chance of observing the light show. We are only just creeping into true darkness as we enter August, so the Sun, which is ironically the source of the particles, is also producing light which is brighter than the light of the aurora. The Sun has decided to help us out though! The Sun is climbing out of its 11 year cycle from a solar minimum – or minimum amount of solar activity. As the Sun becomes more active, it will send more particles into the Solar System, increasing the chance of an interaction in Earth’s atmosphere. So if the stars alight for us and we get a clear night, with high solar activity, we may be lucky enough to see this dazzling display of lights. Keep your fingers crossed readers and you two will get to vicariously live through the wonder of the aurora in another blog post full of aurora pictures or videos. While I have watched with enthusiasm as the faces of my students light up when I show them YouTube videos of aurora, I hope that I may be lucky enough to record my own video or describe the lights personally back in the classroom. I love teaching physics, as I find that knowing the science behind the phenomena of the natural world only makes it more beautiful. Taken straight from the sleeping bag. The beautiful sunrise over Atlin Lake welcomes us to the day when we return to civilization. Photo by Sarah Bouckoms. While the Sun wakes me up earlier than I would like at times, watching it lighting up the glaciers as they drip off the jagged mountain peeks from the comfort of my toasty sleeping bag, I have a quiet moment in the morning to myself thinking I must have done something right to wake up to this view. Then the hustle and bustle of the day on the Juneau Icefield begins and we wait for nightfall when the aurora hunters emerge again.